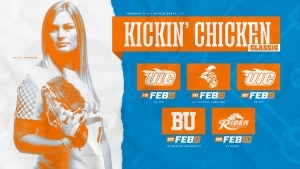 KNOXVILLE, Tenn. — The Tennessee softball team opens the 2019 season in Myrtle Beach, S.C., playing five games in the Kickin’ Chicken Classic. 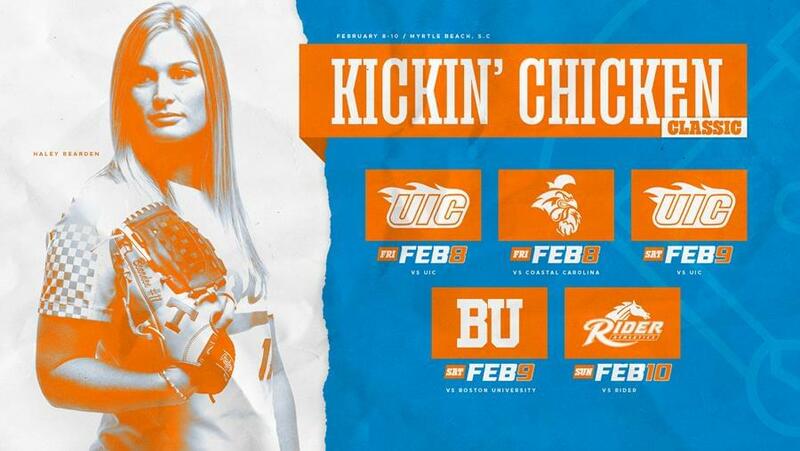 The Lady Vols will take on four teams in three days, facing Illinois-Chicago twice. Tennessee’s other opponents include tournament host Coastal Carolina, Boston University and Rider. The tournament will be played at St. John Stadium. UT comes into the weekend ranked No. 8 in the USA Today/NFCA Coaches Poll, the //ESPN.com/USA Softball Top 25 and Softball America’s preseason poll. The Lady Vols return 14 players from last year’s Super Regional squad and welcome six talented newcomers. All five of Tennessee’s games this week can be followed on UTSports.com via live radio stream by visiting the schedule page and clicking the “Listen” link for each game. UT’s full tournament schedule is listed below. All times listed are EST. UIC vs. #8/8 Tennessee | 9:30 a.m.
Coastal Carolina vs. #8/8 Tennessee | 2 p.m.
#8/8 Tennessee vs. UIC | 4:15 p.m.
#8/8 Tennessee vs. Boston University | 6:30 p.m.
Rider vs. #8/8 Tennessee | 11:15 a.m.
UT has a combined record of 14-1 against this weekend’s opponents, with the lone loss happening in 2004 against UIC. The Orange and White’s most recent matchup with any team in the field was on Feb. 16, 2013, versus Coastal Carolina. UT won the game 10-3. The Lady Vols last faced UIC in 2007, Boston University in 2004 and Rider in 2002. 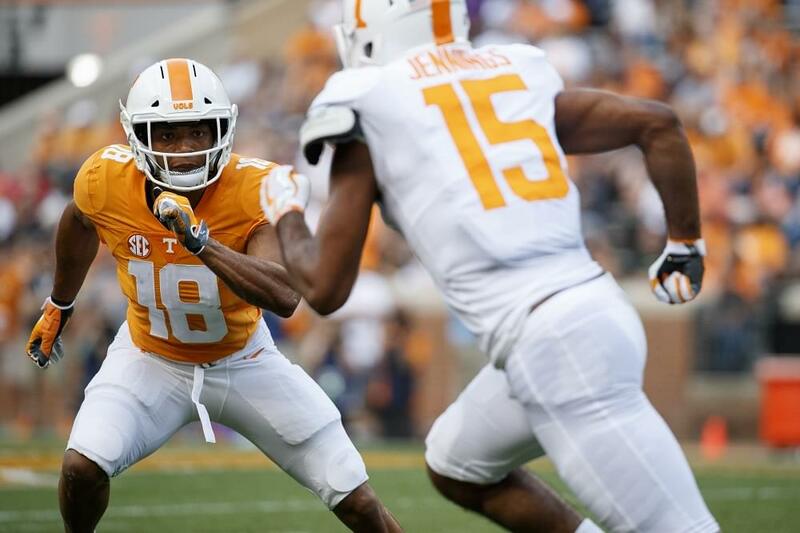 Tennessee threw shutouts in all three contests. It’s the first time since 2006 that the Lady Vols will start the season in the Chanticleers’ tournament. Tennessee went 3-0 in that tourney, beginning what would be a 24-game winning streak to start the 2006 season. Tennessee is 33-3 all-time in season opening tournaments since 2012 and 68-12-1 under Ralph and Karen Weekly (since 2002). In season openers, UT is 16-7 all-time. The Flames finished first in their conference in the regular season for the fourth straight year last season and claimed their 10th League Championship. UIC also advanced to their second consecutive NCAA Regionals in 2018. Third-year head coach Lynn Curylo was tabbed the Horizon League Coach of the Year and amongst UIC’s returners are 2018 Horizon League Player of the Year and All-Region First Team honoree Lexi Watts, All-Region Second Team member Kayla Wedl, All-League First Team honoree Skylee James and All-Freshmen Team members Alyssa Griman, Marley Hanlon and Maddie Spinks. The Lady Vols and Flames last met on March 3, 2007, when UT came away with a 2-0 victory. Coastal Carolina returns 12 players from last season and welcomes eight newcomers to the team. The Chanticleers’ Courtney Dean was recently named to the Sun Belts’ Preseason All-Conference Team. In 2018, she led all freshman in the confeerence with a .345 batting average, 15 home runs, and 39 runs batted in. Tennessee won its last contest with the Chanticleers, 10-3, on Feb. 16, 2013. Coming off the third most wins in program history and its sixth NCAA appearance in 10 years, Boston University was unanimously selected to repeat as the Patriot League champions in January. Led by reigning PL and ECAC Coach of the Year Ashley Waters, the terriers return the reigning Patriot League Player of the Year Alex Heinen, Pitcher & Rookie of the Year Ali DuBois and Patriot League Tournament MVP Madi Killebrew. All three players were tabbed to the conference’s preseason All-Patriot League team. The Lady Vols came away with a 9-0 victory in five innings in their lone matchup with Boston University on Feb. 14, 2004. Rider University junior pitcher Elyse Cuttic was selected to the Preseason All-MAAC Team as designated player. A 2018 All-MAAC Second Team honoree, Cuttic was pivotal to Rider’s 11-win improvement last season as its top home run hitter (6), RBI leader (33) and No. 1 starting pitcher. As a team, the Broncs were selected 10th in the MAAC Preseason Coaches Poll after finishing tied for eighth in Davon Ortega’s first season as head coach. Tennessee defeated Rider 10-0 in five innings on March 1, 2002. Following this weekend’s series, UT has a quick turnaround before heading to Clearwater, Fla. Tennessee heads south for ESPN’s St. Pete/Clearwater Elite Invitational (2/15-17). The Big Orange will take on Notre Dame (who received votes in both major preseason polls), No. 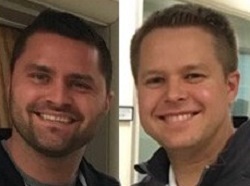 21/23 Minnesota, No. 23/22 James Madison, Utah and No. 1/3 Florida State.